So cute!! I love the colors and the print on that dress. And both ways you style it look great! 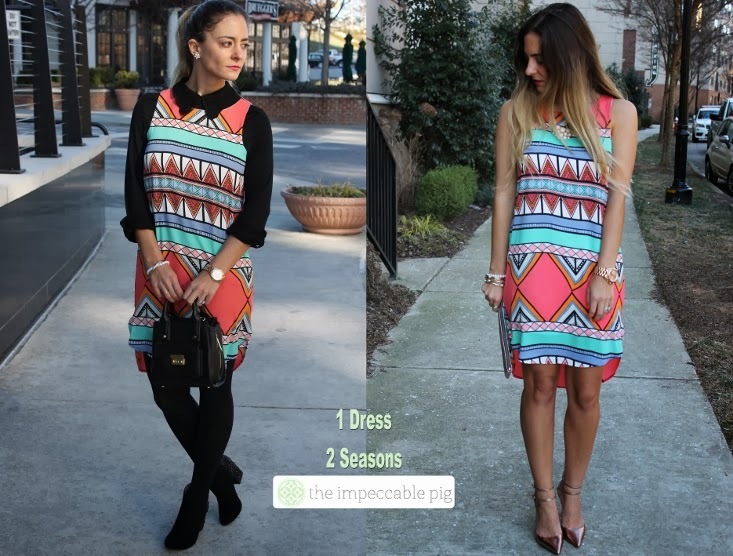 Love that dress and I love that you styled it for both seasons! I hate having to wait all winter to wear my summer stuff! I need to get better and styling things for both seasons! Thanks for the great ideas! I love transitioning dress' like this! So bright and colorful! This is definitely a great transitional dress and you did a great job with adding the black and tights! Nikki, amazing. Love, love the dress and a I love the fact that you can wear it all year long. Both looks are my favorite one. girl that dress is amazing! Ii especially love it with the black tights and collar shirt, so perfect! love! Super cute! With the way this Texas weather has been lately I may have to pack an extra long sleeve shirt to wear under my dress! Thanks for the idea! SUCH a fun print and I love the styling to make it all year round appropriate! Love the colors in that dress! They just opened an Impeccable Pig in my neighborhood in Hillsboro, I have yet to get there, but when it warms up- I'm strolling in! Love that dress - the colors are so so cute! The colors are gorgeous...it really looks fabulous against the all black! I love this!! So, so cute! Those rose gold shoes are unreal! Im obsessed! gorgeous dress, we love how you styled it in both outfits! My favorite piece which I like to wear every season is a chiffon skirt. what an amazing way to restyle a dress! thanks for the inspiration! love both ways that you styled this dress! it seriously works well for all seasons - love it! Love both looks, I never would have thought to pair the dress with a collared shirt and I love the lace detailing. Brings a feminine touch. I love having pieces you can wear in multiple seasons! Love the winter styling! The collar looks adorable over it and the tights are just perfect. Both of your looks are gorgeous! I love how you made it work across seasons. I am going to have to try this with one of my dresses! The pattern of that dress is very pretty, and I like how you made it versatile for two seasons! That dress is impeccably beautiful. What a fun print, design & colors. You did a great job styling it for both seasons. I agree, it looks so sleek with the all-black. =) This boutique is lucky to have you as their own stylista model!